A painter and draughtsman from Antwerp, Hoecke worked in the Flemish style of painting along with his father and brother. His father, Caspar van den Hoecke (1595 – 1648) gave him his first training alongside his brother, Robert van den Hoecke (1622 – 1668). He then entered the workshop of the Flemish master painter, Peter Paul Rubens (1577 – 1640). The artist and his father were well known for their 1635 execution of decorations for the Arch dedicated to the Emperor Ferdinand in Antwerp. In this collection of work, Jan painted monumental representations, as seen in his piece now in the Uffizi Gallery, Triumphal Entrance of Cardinal Prince Ferdinand of Spain. Hoecke then traveled to Austria under the commission of the Emperor Ferdinand III (1608 – 1657) after 1637, staying for about ten years. He also painted for Ferdinand’s brother, Duke Leopold William of Austria (1614 – 1662), including a Madonna and Child and a number of allegorical pieces. Before this he traveled to Italy and worked in Rome, which may have influenced his style some. 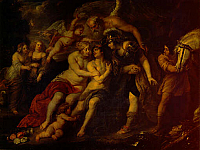 Another piece by Hoecke in the Uffizi Gallery is his, Hercules between Vice and Virtue, which shows an influence from Rubens, but from another pupil of the master Baroque painter, Anthonis van Dyck (1599 – 1641). 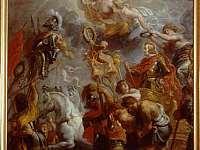 Another religious subject possibly painted by Hoecke is, The Triumph of David, from 1635, which was wrongly attributed to Rubens for some time. The work is an oil sketch from Rubens’ Antwerp studio now in the Kimbell Museum, (U.S). Hoecke also painted still-life works of flowers. The artist was sometimes known as Johannes or Giovanni, with his surname spelled either as van Hoeck, van Hoeck or combined as Vanhoek.